Translucent paint or film colorizes incandescent light bulbs. The added color absorbs the bulb's white light. Unlike lights that depend on the discharge of colored gases for color, coated light bulbs transmit a wider variety of colors. Your needs and interests dictate which one will be helpful. 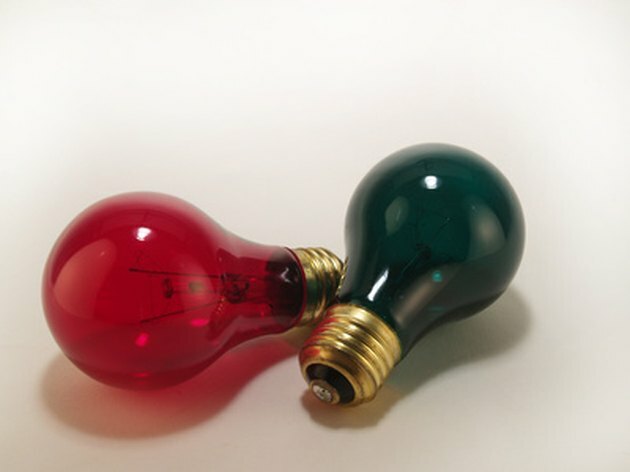 Colored coated light bulbs have decorative and practical benefits. 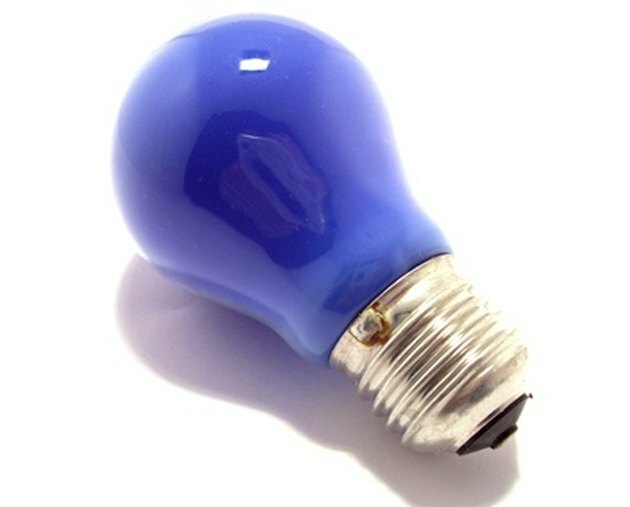 Blue bulbs can make your walls look black. Blue light bulbs may be a perfect answer for children requesting black wall paint in their bedrooms, as the blue bulb can make red walls look black. Experiment with different shades of red paint chips under a blue-coated light bulb to maximize this effect. This solution may also be great for turning your recreation room into a titillating party environment. Yellow light bulbs are less likely to attract bugs. 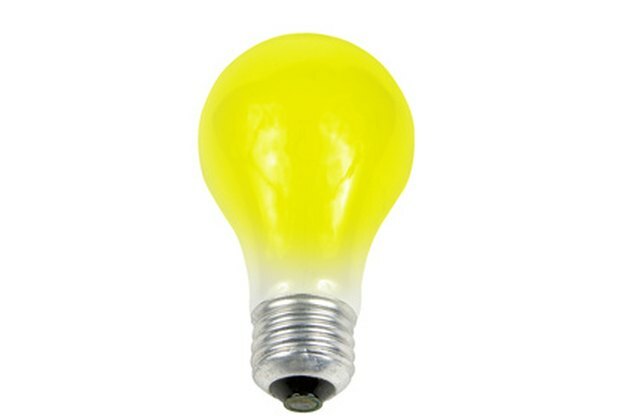 Yellow-coated light bulbs offer you a notable practical benefit. Install them in settings where incandescent light bulbs are attracting swarms of evening mosquitoes to your porch or pool area. Yellow bulbs may ward off those unwanted troops of bugs that don't find them as luring as non-coated light bulbs. Red-coated light bulbs produce a tempting red glow that others can easily see through the curtains of a window. They are useful for attracting the attention of people and for disarming nocturnal animals. Although a few nocturnal animals behave normally under the light of standard incandescent light bulbs, if you want to catch a glimpse of an owl in a nearby tree, try illuminating your backyard with a red-coated light bulb. Green light bulbs produce a wavelength of light that may reset your body clock. Brigham and Women's Hospital research findings reveal that green light exposure may help you overcome jet lag. It may also effectively counter drowsiness when alertness during night work is important. 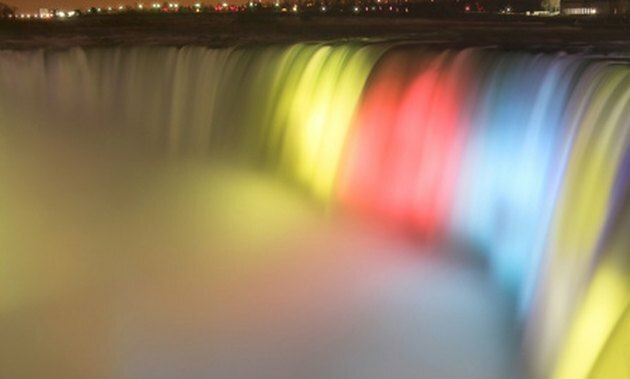 Does the Color of a Light Matter to a Bug?